Krsna says that whenever there is a rise of irreligion or a decline of religion, He appears in this world. Throughout the Vedas, the Highest Entity of truth is known as Bhagavan. In Bhagavad-gita we find the words, sri bhagavan uvaca. This means that the Highest Entity is speaking the Bhagavad-gita. Also, in the Srimad Bhagavatam we find the words, krsnas tu bhagavan svayam (Krsna Himself is the Supreme). Krsna is the avatari – the source of all avataras. In this world, there are different ages – Satya-yuga, Treta-yuga, Dvarpara-yuga and Kali-yuga – and during these yugas there are scheduled descents of Bhagavan. Whenever Bhagavan comes into this world, He has a purpose that will benefit all species of life. Unfortunately, we live at a time when anyone with a little money can print a poster exclaiming, “I am Bhagavan!” But such ‘Bhagavans’ cannot give any real benefit to the people. Of course, many of these ‘Bhagavans’ perform some social work by opening hospitals etc. Opening hospitals is good, but the government has been opening hospitals for a long time. Mother Theresa opened many hospitals and Fidel Castro of Cuba has also opened many hospitals around the world – yet we would not call Mother Theresa or Castro Bhagavan! Opening hospitals is a very good thing, but it is also a very ordinary thing. Opening a hospital is nothing new or extraordinary. However, whenever Bhagavan appears, He does wonderful, extraordinary activities that human beings cannot imitate. In the scriptures we find that Krsna lifted Govardhana Hill. At present, Govardhana Hill is seven kilometers long, but in the time of Krsna it was five kilometers in height. In the evening when the sun would set in the west, the shadow of Govardhana Hill would fall upon Mathura – that is almost forty kilometers away. Therefore Govardhana is called Giriraja, the king of the mountains. Today people consider Nanga-parvata as the biggest mountain in India or Everest as the biggest mountain in the Himalayas, but originally Govardhana was bigger than both of these mountains. However, if you visit Govardhana today it is nearly seven kilometers long but hardly forty meters high at its highest point. Govardhana is slowly disappearing from our sight. Still, there are stones on Govardhana as big as houses. Where is the ‘bhagavan’ who can lift even one of these stones from Govardhana? Krsna lifted the entire Govardhana Hill, but these ‘bhagavans’ cannot imitate this. If you want to buy a silk sari, you have to be careful. You can go from shop to shop and find nylon, Dacron, jute, but not silk. If you want pure silk you have to go to a reputable place that is approved by the government, or a family shop that has been in business for over a hundred years. Otherwise you will be cheated. Similarly, why would there be nothing to guide you when you are looking for God? Think about it. There will be a parampara, an authorized agent, and authorized books. There will be standards. Most people are too simple! Somebody may have some terrible disease and they are told, “Take your medicine, but at the same time pray to our Swami.” They continue to take their medicine, pray to the Swami and ultimately they live. Then they announce, “I prayed to the Swami and I lived!” Then this news spreads and the Swami becomes famous. But there is another fellow who prayed to Swami, but he died! He doesn’t come back and tell you – he can’t, because he’s dead! That is what is known in English as a ‘loaded deck.’ There are also atheists who don’t pray to God at all – but they take their medicine and also recover. There are people that never pray to God but make millions and become extremely rich. Don’t think that the proof of God is that you will get money, or that your health will improve when you pray to Him. The transient nature of sickness and wealth are simply features of this world. I told him, “Yes, this is the difference between Vaisnavism and Christianity. We want to see our God enjoy – and you want to see your God murdered.” Later I wondered, “Why do they think like that?” I realized that suffering is a difficult thing to explain. If you don’t understand the concept of karma, you won’t understand suffering and finally you will want God to suffer also. There are five main subjects that Krsna explains in Bhagavad-gita, and one of these subjects is karma – what is action and what is reaction. Without this knowledge you cannot understand why there is suffering in this world and you will subscribe to the idea that God is very cruel. “He makes me suffer, so He should suffer Himself.” This type of thinking has evolved in some religions. God must come and suffer. He must die. An ultimately what happens is that, rather than becoming religions of peace and love, they become religions of violence and intolerance. Under these types of religions, many people are put to death. These are not real religions. They are not based on real knowledge. They are based on false or misinterpreted knowledge. Real religion is based on knowledge and there is no superior book of knowledge than Bhagavad-gita. This was Krsna’s gift for the whole of humanity, for all time. 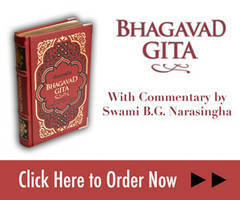 Bhagavad-gita is famous throughout the world and the knowledge found in Bhagavad-gita, to this date, is unsurpassed. It has such a depth of knowledge that even if a scholar of Bhagavad-gita reads it again tomorrow, he will find new wisdom in it. That is because Krsna is infinite and the words spoken by Him are also infinite. Any other body of knowledge has some limitation. Everyone is fascinated by the knowledge of computers now, but can a computer tell us how many particles of sand there are in Mumbai? Can a computer tell us how to make a grain of rice? No! A computer is only as intelligent as the person that programs it. One day, the wonders of the computer and the wonders of the cell phone will be of no more importance than the wonders of a Tata truck. What is a Tata truck? Nowadays such trucks are commonplace, but when the Tata truck was first introduced on the road, people lined up for kilometers to see it. Now we think, “I need the latest type of cell phone, I need the biggest and fastest computer.” This is called maya-sukhaya. Today, if I purchase the best radio available, would everyone be happy to sit around and listen to it for hours? Of course not! Nobody cares for the radio anymore. But when the radio was first introduced, whole villages would sit in front of it and listen. Nowadays a radio is nothing. We became tired of the radio and it was replaced by something else that caught our attention. But Bhagavad-gita has held the attention of the intelligent people of this world for over five thousand years. Some people claim that the Bible is older than the Gita, but historically speaking that is not true. Millions of people were reading Bhagavad-gita before the Bible was even invented – and it was invented! It has not come from God. Some say that the Bible came to India a thousand years ago and that the Bible inspired the Indians to write the Vedas, Upanisads, Mahabharata, Ramayana and the Puranas. Then where did Ayurveda come from? That is also a part of the Vedas. Did that come from the Bible also, wherein it says that one shouldn’t take medicine? How did a book that says that you shouldn’t take medicine suddenly become the source of the Vedic texts on medicine? The Ayurveda has extensive knowledge regarding the science of medicine and surgery. Thousands of years before the people of Europe had even learned what medicine was, surgery was going on in India, metallurgical science was there, theories of atomic energy etc. The idea that the Vedic literature was inspired by the Bible was simply propaganda, created to establish Europe as being the original center of civilization. In order to do that, Asia was put down. During the nineteenth century, there was much talk amongst European scholars about the origins of civilization. Upon discovering India, some scholars became quite perplexed and their main task was to keep the origins of civilization in Europe. This is called the ‘eurocentric worldview’. They said that the Aryans came from Europe to India and made India civilized. However, one difficult point to explain for them concerns the food found in both cultures, In Europe a thousand years ago there was basically only bread and something that you shot in the forest. That was it! And the only spice they had was salt. How did non-vegetarians with such a limited cuisine of bread, meat and salt come to India and create a whole thali? Not only a thali – a Gujarati thali, a North Indian thali, a Punjabi thali, a South Indian thali, and so many other varieties of food! Even today in Italy they have the most complete cooking culture in all of Europe. But still, there is not much variety. If you go to Germany, you may get five or six different preparations. If you go to Norway and other such places, there is mostly fish. There is not much variety. And then there is also music. More or less, the only instrument that truly came from Europe was the guitar. How did the guitar come to India and transform into the sitar, the vina, or the tambura? There is so much detailed knowledge of music in India. Therefore how can India not be the mother of civilization? For many years, so-called scholars said that the Vedas were simply mythology. Ramayana, Mahabharata and the Puranas were basically just tales for children. But let us ask one question – how many years does it take to fully study Sanskrit grammar? How long does it take to study and compose Sanskrit poetry? It takes twenty to twenty-five years for someone to become a kavi (poet). After becoming such great poets, why did the ancient rsis decide to write fairy tales for children? That would be like attending a classical music academy for many years and after finishing your studies, going to Mumbai simply to compose jingles for Coca-cola commercials on TV! It is more likely that after learning the highest standard of music, you would go on to perform and present classical music. It is foolish to say that the Vedas, which are written in the most advanced language, are simply mythological stories and histories that never really happened. In India, it is well known that the oldest God on this planet is Visnu, Krsna, or Rama and everybody knows that civilization began in India. The ksatriyas left India after Parasurama destroyed their dynasties. They settled in the west during the Pre-Egyptian era and started civilizations all over the world. After these civilizations grew, people began to wonder where the first civilization originally came from. At one time, people said that civilization began in Baghdad, between the Tigris and the Euphrates rivers. Here in India we have the Ganges and Yamuna – the Sumerians had the Tigris and the Euphrates. But in modern times, that idea has basically been rejected. The knowledge is there that India is the mother of civilization, but that knowledge is being kept hidden. If somebody wants to update the history textbooks, someone will object, “No, no, no – why do you want to update our textbooks?” Darwin’s theory has been disproven a hundred times all over the world, but still, when new textbooks are printed in India, they propagate Darwin’s Theory of Evolution. Then one may argue, “If Darwin’s theory is correct, why worry about caste at the time of marriage? We all come from monkeys anyway.” That is Darwinism. In India everyone is concerned with class and caste. That is natural. But in the textbooks that your children study, it says that we all evolved from apes. One day your son will tell you, “Father, why does it matter who I marry? It is written that we all come from monkeys anyway.” Monkey caste! Of course, I may be joking about it, but society considers caste and community to be very important. Yet the educational system says that we all come from monkeys. That is the so-called knowledge our schools and universities teach. Real knowledge can be found in every word of Bhagavad-gita. In the purport to this verse, yada yada hi dharmasya, Srila Prabhupada has placed emphasis on one particular word srjami. Srjami means that Krsna was not created here – Krsna came here as He is. Krsna exists beyond the universe and the knowledge of this is in this one word – srjami. Srjami means that Krsna is not born according to the laws of karma. We are born from a womb, but Krsna is not born from a womb. 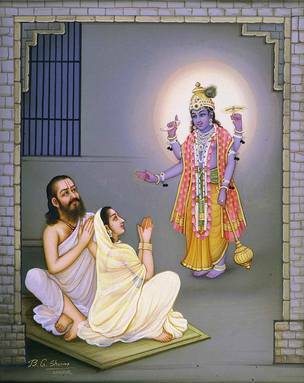 The Bhagavatam explains that when Devaki and Vasudeva were in Kamsa’s prison, all the demigods came to offer prayers and then Visnu appeared. Everything was basically human-like up to that point, but then He made His grand appearance. First He appeared to Devaki and Vasudeva as Visnu. He was fully decorated and holding a conch-shell, disc-weapon, club and lotus. Vasudeva and Devaki prayed to Visnu, “Please become our son.” Then He manifested as baby Krsna. Krsna was not born in a maternity ward, or with the aid of a midwife, nor from the womb. The story goes on to tell how Vasudeva and Devaki became fearful of Kamsa discovering Krsna, how Vasudeva swaddled Him, how the gates mysteriously opened and how Vasudeva escaped undetected from the dungeon while the guards slept. That is the wonderful appearance of Krsna. We have all seen pictures of ourselves when we were small children. Can you imagine being able to live at any stage of your life at any time, all at once with no confusion? That is Krsna. Krsna can live as a baby, a child, a youth, a young man. He can live in all stages of life simultaneously. He is not born, enduring a period of growth from childhood to manhood and old age. He is eternally a child, eternally a youth and eternally an adult all at once. Is this impossible? Yes, it is impossible! It does not fit into the spectrum of the possibility of this world. He is beyond this world. The scriptures say that Krsna walks and He does not walk, He talks and he doesn’t talk. You and I were born and we grow old. We cannot show ourselves as we were two years back. That is impossible. We continue to age and there is no going back. Krsna is not like that – He is living every stage of His life simultaneously. Our experiences in life are actually very small. But Krsna lives a life beyond our experience. He is nava-yauvana, ever youthful. He is always a young boy. He is all of these things simultaneously and everybody that is eternally with Him is also like that. When you calculate the timeframe of the Mahabharata, Krsna was around 125 years old when He spoke Bhagavad-gita. But according to those who saw Him, He looked as though He was only sixteen or seventeen years of age. If any of us reached 125 years of age, our skin would become wrinkled and our hair would fall out from our heads. We never hear that Rama or Krsna became old. We become old men and women, our teeth fall out, our hair falls out, we become deaf, but we don’t hear that Rama or Krsna ever became old. Old age is something that only happens in this material world to people who are born according to karma. Old age is under the law of karma, and Krsna and Rama are above karma. Some people define eternity as, ‘a long ‘time’. But, no! Remove time and what remains is eternity. Eternity means no past, no present, and no future. The element of time is a dominant energy in this world and it is understood in terms of past, present and future. But in the world of Krsna, there is no concept of time. Time is absent – there is no past, no present or future. That is called adhoksaja, – beyond. We must always keep this in mind when thinking about the pastimes of Krsna and Rama. When we think about the pastimes of Rama, it is quite straightforward. Lord Rama stands morally upright in society. He performs great sacrifices and goes to the forest when He is sent into exile. His life is very harsh, He has to fight to retrieve Sita etc. Rama’s pastimes are much simpler as compared to Krsna’s. Rama’s pastimes as a child are not given much emphasis. When we think of Rama, we generally think about His activities as a man when He is sent to the forest, loses Sita, fights with Ravana and becomes the king of Ayodhya. His childhood pastimes are not an important part of His lila. When thinking about Krsna’s pastimes however, it is somewhat challenging. Krsna is so mischievous because He is displaying His pastimes as a boy. But when thinking about Krsna we have to remember that He is not subject to the laws of material nature. He is not within the jurisdiction of karma. When the ordinary people think of Krsna, they consider, “Oh, He steals butter and gives it to the monkeys, He steals the girls clothes etc.” If a small boy of six years old goes and steals the ladies’ clothes, what is that? It is mischief. We would consider such a child naughty and innocent. That is Krsna. But some people think of Krsna as if He were some lusty old man stealing the clothes of the ladies – if you think like that then you are mixing in nastiness and wickedness. Krsna is a mere boy. He sees the clothes, laughs and steals them. He steals the butter and gives it to the monkeys. Such activities are charming. Ultimately, Krsna does not steal anything, because everything already belongs to Him. He doesn’t steal anybody’s wife, because all wives already belong to him. One must be philosophically minded when thinking of Krsna. Krsna is made of sat (eternity), He is made of cit (knowledge), and the most important element found in Krsna is called ananda (bliss). Factually speaking, we don’t know what eternity is, we don’t know what knowledge is and we don’t know what bliss is. We think these are abstract things of which we may have some experience. What is knowledge? Is knowledge something that we study in school for passing exams and getting on with life? Is knowledge something we simply find in a book? No. What is bliss? Does bliss simply mean happiness or laughter? Is Krsna simply made of laughter? Krsna is saccidananda-vigraha – He is the pure form of all those things. Krsna is not an atma inside a body. Krsna is His body. You, on the other hand, are an atma within a body. Daily, so many bodily changes appear, but inside you are same. Externally your voice changes and even your mind changes – but you, the atma, remains the same. The atma never changes. The atma is also sat-cid-ananda, and the atma has a form also. We are of the same quality as Krsna. This world is a foreign land. We don’t come from this place. We cannot permanently stay in this place, and we are destined to move on. It is just a question of where and when we going to move. You can move laterally across this world, you can even travel down to Patalaloka, the lowest planetary system in this universe. You can go up to the celestial regions of Svargaloka for some time, but like a politician’s term in office you will go up and then you will eventually come down. You cannot stay there. But when you reach Vaikuntha, the spiritual realm, there is no coming down. Vaikuntha is a complete world, with complete universes and complete planetary systems. Everything there is sat-cid-ananda. There is no janma, mrtyu, jara, vyadhi, (birth, death, old age, and disease). It doesn’t exist. There is no time there, no lust, no hate, and no greed. If you removed lust and greed from this world, all the major cities would disappear. They are all driven by lust and greed. This is the material world. If you removed lust and greed there would be no wars. Greed is the most horrible thing there is. That mentality of “I want, I want” is what causes us to suffer. It is what causes the world to suffer. This is the mantra, the meditation, and the process to awaken our eternal consciousness of Krsna.